At Knee NI, we perform hundreds of procedures every year with consistently high patient satisfaction. With a proven record of effective treatment and recovery management, you can be sure that you will receive the highest quality of care at Knee NI. What knee condition may I have? What proceedures are available at Knee NI? The extensive experience of our award-winning consultants, Mr Pooler Archbold and Mr Roger Wilson covers a comprehensive range of orthopaedic procedures, from arthroscopic ‘key-hole’ surgery to ligament reconstruction, cartilage repair, partial, total and revision knee replacement. You can be sure you are in the best of care with Ortho NI’s leading knee specialists. The knee is made up of 3 bones. The femur (thigh bone), the tibia (shin bone), and the patella or knee cap. When describing the knee doctors talk of three ‘compartments’ which are the three areas where the bones of the knee make contact with one another. The medial (the inside half) and lateral (the outside half) compartments are formed by the rounded ends of the femur (condyles) making contact with the flat top of the tibia. 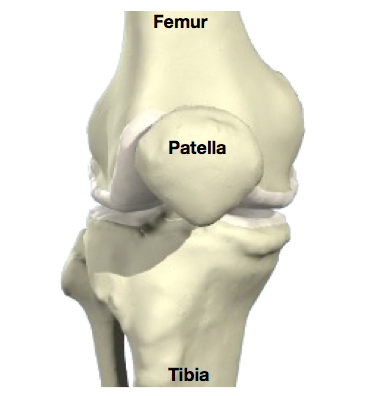 The patello-femoral compartment is where the knee cap makes contact with the femur bone, below it. Within each compartment the ends of the bones are coated in articular cartilage. The function of articular cartilage is to absorb shock and provide an extremely smooth surface to facilitate motion. We have articular cartilage essentially everywhere that two bony surfaces move against one another, or articulate. The menisci are two c-shaped cartilaginous structures interposed between the femur (thigh bone) and the tibia (shin bone). The outer one is called the lateral meniscus and the inner one is called the medial meniscus. The main function of the menisci is load absorption. Their secondary function is to augment the stability of the knee. 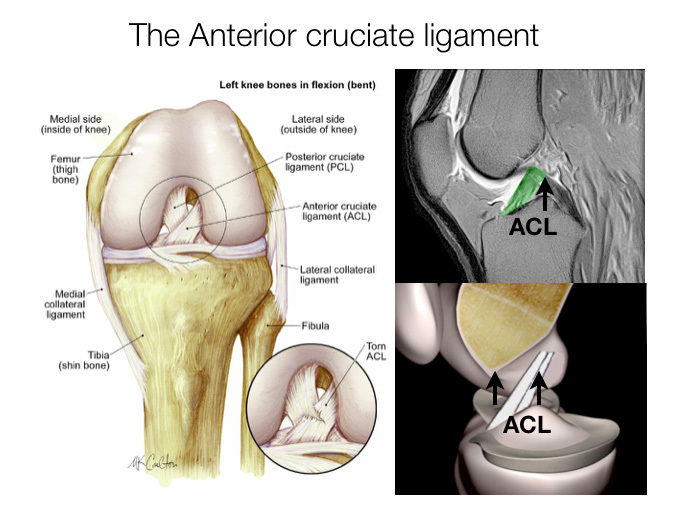 Anterior cruciate ligament (ACL). The ligament, located in the centre of the knee, that controls rotation and forward movement of the tibia (shin bone). Posterior cruciate ligament (PCL). The ligament, located in the centre of the knee, that controls backward movement of the tibia (shin bone). Also known as ACL tear, ACL rupture, The ACL is one of the main stabilising ligaments of the knee. It runs through the centre of the knee from the back of the thigh bone (femur) to the front of the shin bone (tibia). The ACL prevents excessive anterior translation and rotation of the tibia. This action is critical to the stability of the knee whilst sidestepping, or pivoting therefore when the ACL is ruptured or torn the tibia moves abnormally such that the knee buckles or gives way. The ACL is typically injured in a non-contact twisting movement involving rapid deceleration on the leg or a sudden changing of direction such as side stepping, or pivoting. The ACL can also be injured by a direct blow to the knee or by hyperextension. When you tear your ACL, you typically hear a popping noise and feel your knee give way. Pain with swelling. Immediate swelling in the knee due to bleeding from the torn ligament. If ignored, the swelling and pain may resolve on its own. However, if you attempt to return to sports, your knee is usually unstable and you risk causing further damage to the cartilage (meniscal tear) of your knee. Tenderness along the joint line – this is due to bruising of the bone and possible damage to the cartilages of the knee (meniscal tear). X-rays of the knee are usually normal therefore if there is a suspicion of an ACL tear the investigation of choice is a MRI. After an ACL injury your knee is swollen and will stiffen up over 48 hours. Following this your knee enters what is referred to as ‘the inflammatory phase’. If the ACL is reconstructed during this phase there is an increased risk of arthrofibrosis (scarring and post-operative stiffness). Initial treatment therefore concentrates on minimising swelling and restoring a full and pain free range of movement. This often takes about 6 weeks. Some low demand patients following physiotherapy and lifestyle modifications will have no instability of their knee. In this group of patients non-operative management is indicated. In higher demand patients or professional athletes (particularly if you wish to return activity such as jumping, cutting, side-to-side sports, heavy manual labor) or those who have frequent buckling episodes an ACL reconstruction is indicated. 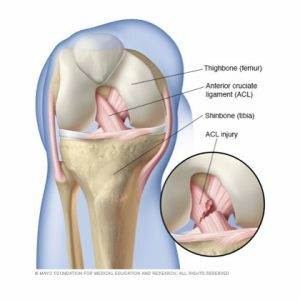 Reconstruction of the ACL is done arthroscopically (key-hole) and involves replacing the torn ACL with a graft. This is usually taken from the hamstring tendons. The aim of surgery is to prevent the repeated episodes of giving way of the knee. Published results indicate that approximately 90% of patients consider their knee to function normally or nearly normally after surgery. Full contact sport is allowed after 9 months of rehabilitation but not everyone gets back to their previous level of sport. Other problems such as joint surface damage or meniscal tears may co-exist which can interfere with the joints ability to tolerate the high loads associated with sport. Also known as Patellofemoral pain, Anterior Knee Pain is a symptom not a diagnosis. The term simply means ‘pain at the front of the knee’. Anterior knee pain is one of the most common of knee complaints. A thorough history and clinical evaluation is important to define the cause. The investigation of choice is a MRI scan. It is useful in defining the cause of anterior knee pain. However often its findings correlate poorly to the degree of symptoms. The cause of pain is not clearly understood and is multi-factorial. Numerous factors have been proposed including limb mal-alignment, muscle weakness, patella mal-tracking. It is common in adolescents and young adults, but it can occur at any age, specifically those who are physically active and exercise regularly. 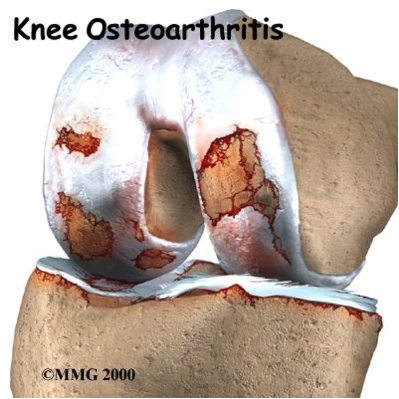 A form of knee osteoarthritis common among those in middle and older age. Perpatellar bursitis (housemaid’s knee) – inflammation of a bursa (a small sac of tissue) in the knee. Infrapatellar bursitis (parson’s knee) – inflammation below the patella. Otherwise known as jumper’s knee, this is a common and painful overuse disorder. Painful condition common in physically active adolescents and children. It affects the upper shin. It is aggravated by jumping and kneeling along with sporting activities. It is not serious and tends to go away with time. It is due to softening and degeneration of the cartilage on the patella or to the cartilage on the lower end of the femur on which it slides. Mal-alignment of the patellar often paired with damage to the cartilage behind the patella. Common in adolescence, often comes with pain and tenderness. It is usually without symptoms but can vary in severity and may somtimes need surgical treatment. Most cases of anterior knee pain are self-limiting and the treatment is primarily non-surgical. Treatment should be directed towards the cause of the pain. Education – Explanation of the benign nature of the many conditions that cause anterior knee pain. For instance the natural history of Patellofemoral pain syndromeis for the symptoms to resolve after 6 months with an appropriate rehabilitation program. Painkillers and anti-inflammatories – mild/ moderate pain killers and anti-inflammatory medications may be taken to provide symptomatic relief. Also known as Cartilage injury, the articular cartilage is the smooth white shiny layer of tissue that is a few millimeters thick. It covers the surfaces of the ends of the bones inside the joint. 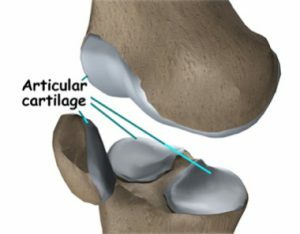 Articular cartilage has the lowest coefficient of friction of any substance known to man, and its function is to make the bone surfaces in the joint smooth and slippery, to allow the joint to move freely. Articular cartilage damage is a spectrum of injury from single, localised defects to advanced degenerative disease of articular cartilage (knee osteoarthritis). The cells in articular cartilage are not very metabolically active, and as they have no blood supply they get their oxygen and their nutrition by diffusion from the joint fluid (synovial fluid) in the knee. The relevance of all this is that articular cartilage has very little self-healing potential, and therefore once it is damaged or worn, it tends not to be able to heal up or repair itself on its own. Injury to the articular cartilage may be caused by acute trauma (direct blow or instability secondary to ligament injury during sport), chronic repetitive over load or occur spontaneously (osteochondritis dessicans). Xrays are used to rule out osteoarthritis and check the alignment of leg. MRI is the best investigation to localise the size and location of the articular cartilage injury. Surgery is indicated following the failure of non-operative management. Treatment is individualised dependent on patient age, skeletal maturity, low vs high demand activities, the ability to tolerate extended rehabilitation and the size of cartilage injury. The word “chondromalacia” means “cartilage softness”. Chondromalacia patellae is a common cause of anterior knee pain. It is due to softening and degeneration of the cartilage on the knee-cap (patella) or to the cartilage on the lower end of the femur on which it slides (femoral trochlea). A number of factors contribute to the development of chondromalacia patellae these include overuse, previous trauma and anatomical/genetic predisposition. There is no evidence that chondromalacia patellae progresses to patella-femoral arthritis, which is probably a different entity. In contrast to osteoarthritis, where initial changes to the cartilage occur on the surface, the changes in chondromalacia patellae commence in the deeper layers of cartilage and involve the surface layer later in the development of the condition. A dull, aching discomfort localised around or behind the kneecap. The pain is aggravated by activity (running, jumping, climbing or descending stairs) or by prolonged sitting. Other symptoms that may feature are a sensation of catching or giving way, crepitation, and swelling of the knee. The investigation of choice is an MRI scan. It is useful to rule out other causes of anterior knee pain and to confirm the extent of the cartilage damage. However its findings correlate poorly to the degree of symptoms. Most cases of chondromalacia patellae are self-limiting and the treatment is primarily non-surgical. Surgery is rarely indicated. In those patients who have a localised cartilage flap that catches when the knee moves, there may be an indication for surgery. However the results from surgery are variable. Also known as IT band Friction Syndrome, The IT band is a sheet of tissue that runs down the outer side of the leg, from above the hip down to just below the outer side of the knee. 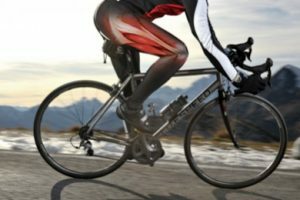 In runners, cyclists or other people who exercise a lot, the IT band is repetitively shifted forward and backwards across the lateral side of the knee causing friction, inflammation and pain. This is called ‘IT Band Syndrome’. Activity related pain localized to the outside of the knee. The pain typically eases with rest. Non-operative management is indicated as the first line of treatment for IT Band syndrome. Physiotherapy and training modifications are the mainstay of treatment and are usually sufficient to resolve the symptoms. If conservative management fails and symptoms continue for longer than 6 months a surgical IT band release (a day case operation) may be indicated –the post-operative rehabilitation takes around 3 months prior to a return to heavy activity. Knee Arthritis, also known as Arthrosis, Wear & Tear is a general term covering numerous conditions where the joint surface (articular cartilage) of the knee wears out. When this occurs, the bone ends rub together and this is painful. In general it affects people as they age (Osteoarthritis-wear and tear arthritis). Overweight: Excess weight increases the load across the knee and contributes to the progression of arthritis. Weight loss can make a dramatic change to the level of your knee pain. Rheumatoid arthritis is a widespread disease found throughout the body in which the patients own immune system mistakenly attacks the joints causing widespread inflammation and damage. Osteoarthritis of the knee is diagnosed by a clinical examination and the history of your symptoms. X-rays are useful to evaluate the extent of any damage and help your doctor decide the most suitable treatment. The X rays will show a narrowing of the space between the bones in your knee (see below). This indicates the extent of wear to your articular cartilage. Joint replacement is usually only indicated if bone on bone is present on the X ray. As yet there’s no cure for osteoarthritis, but there are a number of treatments that can help ease symptoms and reduce the chances of your arthritis becoming worse. This helps to lubricate your knee joint. They are sometimes given when steroid injections don’t work. At present it isn’t widely used as it is more expensive than steroid injection and the evidence that it works better isn’t convincing. 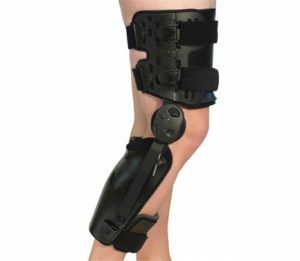 Knee braces: These work by offloading the worn part of the knee. The form of surgery chosen should be the least invasive approach required to provide long-term pain relief and restore function. Arthroscopic debridement: This procedure typically provides relief for a limited time only after which more definitive measures i.e. knee replacement is required. Its role is therefore limited to carefully selected patients. 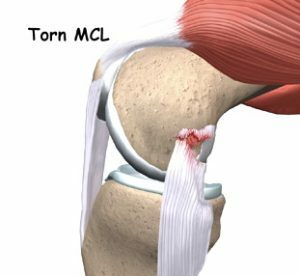 The MCL, also known as: MCL tear, MCL rupture is one of the main stabilising ligaments of the knee. It passes down the inside of the knee from the end of the thigh bone (femur) to the top of the shin bone (tibia). The MCL prevents excessive sideways opening of the knee joint. This action is critical to the stability of the knee whilst sidestepping. A MCL injury occurs when the knee is bent inwards towards the other knee stretching and then tearing the ligament. Injury to the MCL is divided into three grades of severity. Grade 1 – the ligament is stretched with small tears within it. This is able to keep the knee stable. Grade 2 – the ligament is stretched so that it becomes slightly loose. Grade 3 – the ligament is completely torn. There is a risk that other ligament damage has occurred. When you tear your MCL, you typically have pain over the ligament on the inside of the knee. Swelling – localised swelling on the inside of the knee. X-rays of the knee are usually normal therefore if there is a suspicion of an MCL tear the investigation of choice is a MRI. 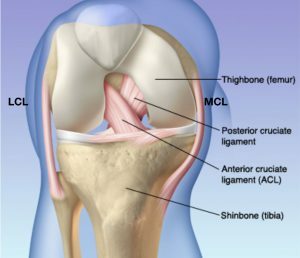 The MCL is a ligament that can heal itself in the right circumstances. Most MCL injuries are Grade I. Braces are used for Grade II injuries. Surgery is only occasionally indicated in Grade III injuries that fail to heal with conservative management (12 weeks) or in multi-ligament knee injuries. Physiotherapy – Physiotherapy should be used in all grades of injury to help relieve the pain and keep the knee moving. Bracing- Prevents the knee from being moved sideways, while allowing a knee to flex and extend. This allows the MCL to heal in the position of function whilst preventing stiffness. Return to play follows healing of the ligament and a focused physiotherapy program that includes a graduated strengthening program, core stability and upper body conditioning, a plyometric program and sports specific exercises. For a surgically managed MCL or multi-ligament injuries full contact sport is allowed after 9 months of rehabilitation but not everyone gets back to their previous level of sport. Other problems such as joint surface damage or meniscal tears may co-exist which can interfere with the joints ability to tolerate the high loads associated with sport. Also known as: cartilage tears, the menisci are two C-shaped shock absorbers that lie within the knee between the femur (thigh bone) and the tibia (shin bone). They function to optimise force transmission across the knee joint, stabilise the knee and to provide proprioceptive feedback. The medial meniscus is on the inner side of the knee and the lateral meniscus is on the outer side. Traumatic tears: These result from a sudden high load being applied to the knee. They to occur from twisting on a loaded knee, e.g. rugby side step, football tackles, slips or ski accidents. Degenerate tears: As you get older, the menisci become progressively weaker, and are more prone to tear. Around half of meniscal tears in patients over the age of 45 occur spontaneously without a history of an injury. Pain on the inside or outside of the knee. Mechanical symptoms such as clicking, catching and locking can be caused by displaced tears. Delayed or intermittent knee swelling. The investigation of choice to confirm a tear is an MRI scan. However if you are over the age of 40 or if your surgeon suspects that you may have some associated arthritis in your knee X-rays of your knee will also be requested. Non-operative management is indicated as the first line of treatment for degenerate tears when the symptoms are mild and if there is no significant functional impairment or mechanical symptoms. 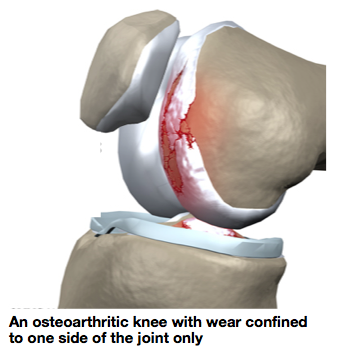 Surgery is not be indicated if you have significant co-existent osteoarthritis within your knee. Physiotherapy – keeps your knee strong and flexible and reduces pain.Surgery may be required if a meniscal tear is causing significant symptoms, functional impairment or if your knee is locked or won’t fully straighten. If you’re in this category then you need an MRI scan as soon as possible. Arthroscopic Menisectomy or Meniscal repair – Surgery for a meniscal tear is done arthroscopically (key-hole). At the time of surgery the tear is typically resected or if it meets certain criteria (a recent peripheral tear, a younger age or a combined ACL reconstruction) it may be repaired. The goal of the surgery is to relieve pain and improve function. This will require physiotherapy in addition to the surgery. 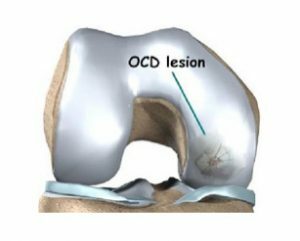 Osteochondritis Dissecans (OCD), also known as: OCD lesion is a disorder that tends to occur in younger people (children and young adults). It is where a piece of bone (osteo) plus the overlying articular cartilage (chondral) becomes partially or completely detached from the joint surface. It most commonly occurs in the knee. The exact cause of OCD is not known. However it is likely that it is caused by repetitive microtrauma, or by interruption to the blood supply of the cartilage and underlying bone. Xrays are useful and can diagnose the OCD lesion. MRI is the best investigation to characterise the size and location of the lesion, the status of the joint and the presence of loose bodies. The outcome of OCD is correlated to the age that it presents. A younger age correlates with a better prognosis. Open growth plates are the best predictor of successful non-operative management. Surgery is indicated following the failure of non-operative management. Treatment is individualised and dependent on patient age, skeletal maturity, and the integrity of the of OCD lesion. 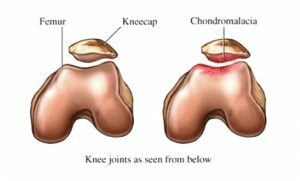 Also known as Episodic patella dislocation, this condition is defined as a history of one or more dislocations of the patella. There is normally an initial traumatic event, non-contact twisting injury or a direct blow. 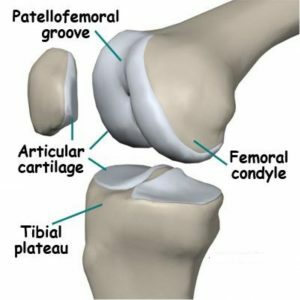 In over 90% of patients who suffer a dislocation of the patella there is an abnormality in the shape of the groove that the knee cap runs in. If the patella ‘pops out’ (to the outer/lateral side of the knee) fully, then this is called a ‘patellar dislocation’. If it pops out only partially, this is called a ‘subluxation’. Often, a patellar dislocation may reduce itself back into place spontaneously. Otherwise the kneecap may need to be manipulated back into place under ‘gas and air’, either by ambulance crew or potentially in an A&E Department. After a patellar dislocation, the tissues around the inner side of the knee that help hold the patella in place (medial patellofemoral ligament) are torn. If it is a first time dislocation you will be treated in a splint to allow this to heal and scar. However in 50% of case it does not heal properly leaving residual ‘weakness’ and risk of further dislocation. If you have had a patella dislocation your knee will be acutely swollen and painful and you may complain of a feeling of continued instability. Following a dislocation Xrays are required to rule out a fracture or loose body and to make sure that the patella is back in joint. The investigation of choice is a MRI scan which helps rule out subtle damage of the joint surface (articular cartilage). If you dislocate your patella for the first time without any loose bodies or joint damage a trial of non-operative management should be undertaken. Short-term immobilization – brace for 2-4 weeks to allow the soft tissues on the inside of the knee to heal. Physiotherapy – quadriceps, core strengthening and stretching exercises – restoration of good quadriceps strength and function is an important factor in achieving stability. Painkillers and anti-inflammatories – mild/ moderate pain killers and anti-inflammatory medications may be taken to provide symptomatic relief following a patella dislocation. If you have 2 or more dislocations then surgery may be indicated to stabilize the knee cap and prevent damage to the joint surface. If there is damage to the surface of the knee joint following a dislocation then key hole surgery may be required to tidy this up. Also known as: Jumper’s knee, Patella Tendonitis is an activity related anterior knee pain with patella tendon tenderness. It is due to micro-tears of the patellar tendon typically a result of repetitive activity such as high intensity training, running, jumping and kicking, all of which place continuous stress on the patellar tendon. This overuse causes very small tears in the tendon leading to inflammation and pain. Initially the pain occurs following activity and it is more noticeable when going up and down stairs. Ultrasound and MRI show thickening of the tendon. Anti-inflammatories may relieve pain and reduce inflammation. Depending on the severity of the condition, recovery could last from 2 weeks to several months. Posterior Cruciate Ligament (PCL) Injury, is also known as PCL tear or PCL rupture. The PCL is one of the main stabilising ligaments of the knee. It runs through the centre of the knee from the back of the shin bone (tibia) to the front of the thigh bone (femur). The PCL prevents excessive posterior translation of the tibia. The PCL is stronger than the ACL. It requires a more powerful force to tear it and it is therefore a less common knee injury. The PCL is typically injured when there is impact to the front of the shin pushing the tibia directly backwards (dashboard injury). 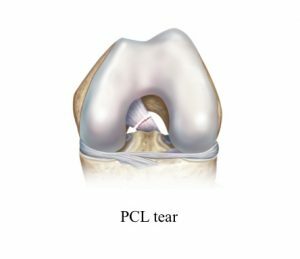 A PCL tear can also occur from hyperextension injuries or from rapid forced flexion injuries (eg falling and landing on a deeply bent knee). PCL tears cause pain and some swelling, but this tends to be less severe and obvious than that seen with an ACL tear. Typically people don’t realise that they’ve sustained what is actually a significant injury in the knee and the injury can be missed for a number of weeks. X-rays of the knee are usually normal therefore if there is a suspicion of a PCL tear the investigation of choice is a MRI. If you have suffered an isolated PCL tear a course of non-surgical management is often undertaken. Immobilisation – a 12 week period of brace immobilisation may be recommended in complete PCL tears. These braces push the tibia forward to allow the PCL to heal in the correct position. If the knee is functionally unstable despite 6 months of appropriate physiotherapy or if the PCL is part of a multi-ligament knee injury, then surgical reconstruction may be indicated. Having either self-referred or been referred by your GP or physiotherapist, you will receive an appointment date to see one of the consultant partners. Following this initial consultation, further investigations such as an MRI scan may be required. Surgery may also be necessary – in which case, we will arrange a date that is convenient for you and conduct a pre-operative assessment to ensure your safety for anaesthesia. Traumatic tears result from a sudden high load being applied to the knee. This commonly occurs after a twisting injury. Degenerative tears are due to mechanical failure of the menisci. As you grow older the menisci become less elastic and may fail under minimal trauma (such as just getting down into a squat). Sometimes there is no history of injury. Pain is the most common symptom of a torn meniscus. The pain is typically felt along the joint line. Any twisting, squatting or impact activity will pinch the tear and cause pain. Swelling may occur. Typically, the swelling appears the following day after injury. 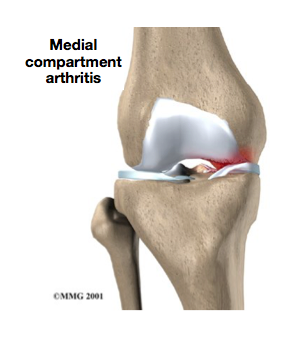 Locking occurs when a fragment of torn meniscus gets caught in the hinge mechanism of the knee. This will result in incomplete straightening of the leg. The menisci are relatively avascular structures (poor blood supply). The clinical importance of this is that surgical repair of the menisci is only recommended for some peripheral tears where the blood supply will aid healing. The more common situation is that a tear will not heal and will therefore need to be excised. If the knee is locked and cannot be straightened out, surgery may be recommended as soon as reasonably possible to remove the torn portion that is caught within the joint. 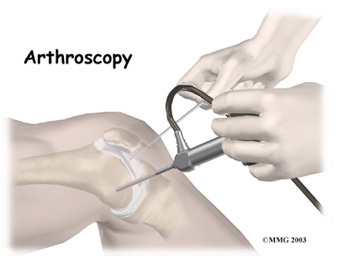 Arthroscopy is the surgical visualisation of a joint using a narrow telescope. An arthroscopy of the knee is ‘keyhole’ surgery. 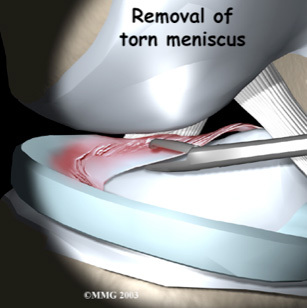 When the meniscus can be repaired sutures are placed around the tear. The more common scenario is arthroscopic resection of the damaged meniscus. What is involved for you as a patient? Healthy patients are admitted on the day of surgery. You will be assessed by your surgeon and consented for surgery. This provides an opportunity for any further questions that you may have. After the operation you will be allowed home when you are comfortable. Your surgeon will visit you postoperatively and explain your surgery. Keep the wound dry for 7-10 days. Use of ice packs is recommended 10-15 mins x3 daily to relieve swelling. Occasionally nylon skin stitches may be required. These require removal 7-10 days post insertion at your local GP surgery. Dissolvable sutures, deep to the skin, require no further attention. Paper stitches and adhesive dressings should be left in situ until they detach naturally. Desk work at 2-10 days. Driving is permitted when you are able to walk comfortably and you are in safe control of your vehicle. This will be determined by the extent of damage to your meniscus and the amount of meniscus that required removal or repair. Training may often be recommenced at approximately 4 weeks after surgery. During the first 4 weeks following surgery it is necessary to be kept partial weight bearing (about 25% body weight) with 2 crutches. Only at the 3-month post-op mark, should you start gradually and carefully returning to running and gentle sport. As with any surgery there are potential risks involved. The decision to proceed to surgery is made when the advantages of surgery outweigh the potential disadvantages. Surgery is carried out under strict germ free conditions in an operating theatre. Despite this infection occurs in 1 in 300 people. This may require further surgery and prolonged antibiotic treatment. Although rare, this complication can be fatal if a clot travels to the lungs (Pulmonary embolism). Previous or family history of clots should be brought to the attention of the surgeon prior to your operation. Numbness at the side of the incisions can occur. This may be temporary or permanent. Stiffening of the knee due to swelling causing difficulty in walking and pain on movement. Rarely some stiffness may be permanent. This is an extremely rare complication that can require further surgery. Even following arthroscopy some patients have ongoing pain or similar symptoms to those they had prior to surgery. Allergic reactions to medications can occur. Following or during surgery there is risk of cardiac or respiratory complications. These risks are increased if you have current medical problems. You must not proceed to surgery until you are confident that you understand this procedure, particularly the complications. The knee is the most complex joint within the body. It depends on 4 major ligaments for stability. There are two ligaments either side of the knee: the medial collateral ligament and the lateral collateral ligament, and two crossed ligaments within the knee the posterior cruciate ligament and the anterior cruciate ligament (ACL). The ACL runs through the centre of the knee from the back of the femur (thigh bone) to the front of the tibia (shin bone). The function of the ACL is in stabilising the knee especially in sidestepping, or pivoting. When the ACL is ruptured or torn the tibia moves abnormally such that the knee buckles or gives way. The ACL is typically injured in a non-contact twisting movement involving rapid deceleration on the leg or a sudden changing of direction such as side stepping, or pivoting. The ACL can also be injured by a direct blow to the knee or hyperextension. Injuries are associated with a popping sensation followed by the development of immediate swelling in the knee due to bleeding from the torn ligament. Depending on the exact mechanism of injury it is also possible to damage the cartilage within the knee or the other ligaments around the knee. Following a tear of the ACL your knee may have a tendency to give way when changing direction or pivoting. This can result in damage to the articular cartilage or the menisci of your knee. Surgical reconstruction is therefore indicated in individuals who wish to return to pivoting type sports and in individuals who have problems with giving way during daily activities. The aim of surgery is to prevent the repeated episodes of giving way of the knee. Published results indicate that approximately 90% of patients consider their knee to function normally or nearly normally after surgery. Full contact sport is allowed after rehabilitation but not everyone gets back to their previous level of sport. Other problems such as joint surface damage or meniscal tears may co-exist which can interfere with the joints ability to tolerate the high loads associated with sport. Wear and tear arthritis that is associated with ligament injury is not necessarily prevented by the reconstruction. Reconstruction of the ACL usually involves replacing it with a hamstring graft. Surgery is performed under general anaesthesia The hamstring tendons are harvested through a small incision on the tibia and then prepared into a new ligament. The inside of the knee is prepared using an arthroscopic (Key-hole) technique. Tunnels are made in the tibia and femur and the old ACL is removed to allow space for the new graft. The new ligament is secured within the tunnels using screws. These usually do not need to be removed. If there is a tear of the meniscus (cartilage) then this is excised or repaired during the procedure. Rehabilitation begins pre operatively to ensure that you and your knee are ready for the operation. Ensure full range of movement, especially being able to fully straighten the knee. Exercises to maintain quadriceps and hamstring muscle strength. Dissolvable sutures, deep to the skin, require no further attention. Occasionally nylon skin stitches may be required. These require removal 7-10 days post insertion at your local GP surgery. Paper stitches and adhesive dressings should be left in situ until they detach naturally. Desk work at 7-10 days. Heavy manual work (ladder work etc) at 3 – 4 months. Driving is permitted when you are able to walk. The knee is made up of 3 bones. The femur (thigh bone), the tibia (shin bone), and the patella or knee cap. When describing arthritis in the knee doctors talk of three ‘compartments’ which are the three areas where the bones of the knee make contact with one another. The medial (the inside half) and lateral (the outside half) compartments are formed by the rounded ends of the femur (condyles) making contact with the flat top of the tibia. The patellofemoral compartment is where the knee cap makes contact with the femur bone, below it. rticular cartilage essentially everywhere that two bony surfaces move against one another, or articulate. Arthritis is a general term covering numerous conditions where the joint surface (articular cartilage) wears out. When this occurs, the bone ends rub together and this is painful. 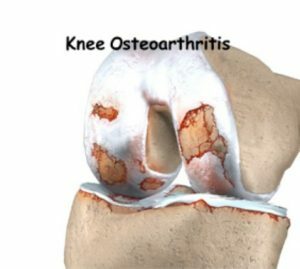 There are numerous conditions that cause arthritis and often the exact cause is unknown..In general it affects people as they get older (Osteoarthritis-wear and tear arthritis) but may also be caused by obesity, overuse, chronic joint instability, trauma and systemic inflammatory conditions. Arthritis may occur in all or just part of the knee. When it is localised to behind the kneecap it is called patellofemoral arthritis. The main reason for replacing any arthritic joint with an artificial joint is to stop the bones from rubbing against each other. This rubbing causes pain. Replacing the arthritic bone gives the joint a new surface, which moves smoothly without causing pain. The decision to undergo surgery is a “quality of life” choice. It should only be undertaken when other non-operative forms of treatment have been tried and have failed i.e. regular painkillers, weight loss, physiotherapy and walking aids. 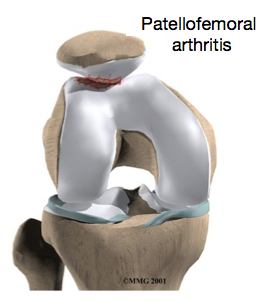 Up until recently, it has been difficult to treat isolated severe arthritis of the patellofemoral joint . In the past once it caused severe pain, the only definitive treatment was a total knee replacement. This operation is ideal for people with advanced diffuse arthritis, but unnecessarily replaced normal parts of the knee. Now there is a modern “partial” knee replacement for the patellofemoral joint. Severe primary arthritis of this joint can now be successfully treated without a total knee replacement. 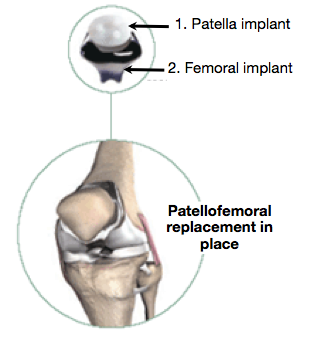 Each patello-femoral knee replacement is made of two parts. The patellar component replaces the bottom surface of the knee cap (the patella). It is made of a very hard wearing plastic. 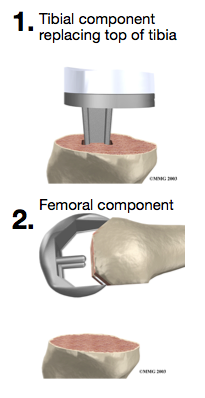 The femoral component (bottom portion) replaces the groove of the thigh bone, the femur. It is made of metal. Surgery is performed under sterile conditions in an operating theatre under spinal or general anaesthesia. An incision is made over the affected knee and the damaged portions of the femur (thigh bone) and patella (knee cap) are then removed. These surfaces are replaced with the implants. The knee is then carefully closed and bandaged. A full medical assessment to ensure that you are fit for surgery and to minimise the risk of complications. Please notify your surgeon if you are taking any anticoagulants (blood thinners). You must contact your surgeon before you go into hospital if you have any evidence of broken skin, ulcers or pimples around the knee which is to be operated on or if you have a cold, cough or infection. Your surgery may have to be postponed until you have clearance that you fit again to have the surgery. Patients should cease smoking and taking hormone replacement therapy two weeks prior to surgery as these increase the risk of life threatening blood clots. Admitted the night before surgery. Re-assessed and examined on the ward by the surgeon or member of surgical team – opportunity to ask questions. The consent form will be completed and your leg marked for the correct side. The day following surgery you will be mobilised with the help of a physiotherapist. Most patients are able to go home after spending one to two days in the hospital. You can be discharged from hospital when you can demonstrate a safe ability to get in and out of bed, walk up to 75 feet with your crutches or walker, go up and down stairs safely, and access the bathroom. Keep the wound dry for 8 days or until the wound has sealed. All stitches are dissolvable therefore do not need removed. Driving Advice: To return to driving at 6 weeks depending on knee function. As with any major surgery there are potential risks involved. Prior to considering surgery a number of non-operative interventions must be tried. The decision to proceed to surgery is made when the advantages of surgery outweigh the potential disadvantages. Clots in the leg (Deep venous thrombosis) The clots cause leg swelling and may break off and travel to the lungs in 1 in 100 people and can cause death in 1 in 3000. Infection This occurs in 1 in 100 people and is a major complication and may require further surgery, the need for a new knee replacement or possibly amputation of the leg. 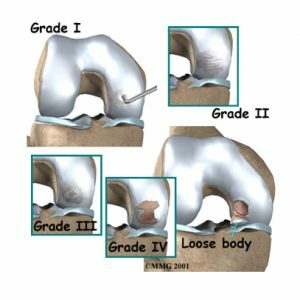 Progression of arthritis requiring revision to a total knee replacement Within 5 years 1 in 20 patients will require revision of their partial knee replacement to a total knee replacement due to progression of arthritis throughout their knee. Loosening of artificial joint Like your own knee the your partial knee replacement can wear out or loosen. However 9 out of 10 knee replacements are still working after 10 years. Numbness around the wound Numbness at the side of the incision can occur. This may be temporary or permanent. Damage to the blood vessel or nerve behind the knee This is an extremely rare complication to the surgery. Stiffness of the knee Stiffening of the knee causing difficulty in walking and sitting and pain on movement in 1 in 100 people. This may require a manipulation if troublesome. Fracture or ligament injury This occurs in 1 in 100 people and may require a period of immobilisation after the operation or possibly the need for further surgery. Anaesthetic risks Allergic reactions to medications and damage to nerves from nerve blocks can occur. General complications Following or during surgery there is a risk of heart attack, stroke, kidney failure and pneumonia. These risks are increased if you have current medical problems. Physiotherpy and an excercise program. The medial patellofemoral ligament (MPFL) helps to stabilise the patella (knee cap). The ligament attaches to the upper third of the patella and the inner aspect of the femur (thigh bone). It functions as a tether to stop sideways movement and dislocation of the patella. Following a patella dislocation the MPFL may become stretched and if symptoms of patella instability persist, a reconstruction of the ruptured ligament may be necessary. 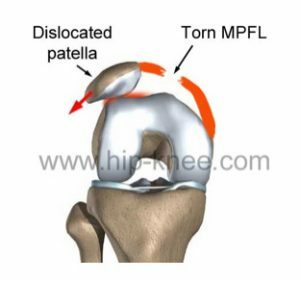 MPFL tears occur when the patella is dislocated either following a non contact twisting injury to the knee or with a direct blow during a tackle whilst playing sport. Following a patellar dislocation, the medial patellofemoral ligament is stretched and torn. If it is a first time dislocation you will be treated in a splint to allow this to heal and scar. However in 50% of case it does not heal properly leaving residual ‘weakness’ and risk of further dislocation. The aim of surgery is to prevent further patella subluxations and dislocations. Published results indicate that approximately 80-90% of patients return to strenuous or very strenuous activities and are more active following surgery. Full contact sport is allowed after rehabilitation but not everyone gets back to their previous level of sport. Other problems such as joint surface damage may co-exist which can interfere with the joints ability to tolerate the high loads associated with sport. 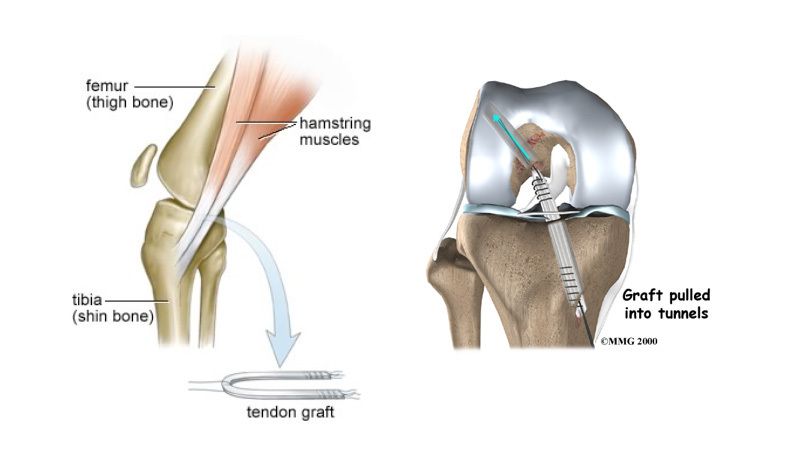 Reconstruction of the MPFL involves replacing it with a hamstring graft. Surgery is performed under general anaesthesia. A hamstring tendon is harvested through a small incision on the tibia and then prepared into a new ligament. The inside of the knee is evaluated using an arthroscopic (Key-hole) technique. The new ligament is attached to the inside of the patella using bone anchors and secured within a tunnel in the femur (thigh bone) using a screw. These usually do not need to be removed. If there is a damage to the cartilage within the knee joint then this is tidied up during the procedure. Driving is permitted when you are able to walk comfortably and you are in safe control of your vehicle. This is typically at 4-6 weeks. Physiotherapy is commenced immediately post-operatively. Phase 5: Return to Sport – 9 months. Re-rupture of the graft occurs in 10% of patients. Failure to provide enough stability in the knee to allow return to full sporting activities. Long term arthritis due to increased pressure in the patellofemoral joint. In addition damage to the joint due to previous dislocation will increase the risk of this. The knee will be sore after the operation. Pain will improve with time. Rarely, pain will be a chronic problem and may be due to other complications listed above. Allergic reactions to medications and damage to nerves from nerve blocks can occur. Following or during surgery there is a risk of heart attack, stroke, kidney failure and pneumonia. These risks are increased if you have current medical problems and can be potentially fatal. A painful knee can severely affect your ability to lead a full, active life. One of the most recent advances in knee replacement surgery is the unicompartmental knee replacement. This type of knee replacement is less invasive than a full knee replacement. The operation is designed to replace only the portions of the joint that are most damaged by arthritis. This can have significant advantages, especially in younger patients. Removing less bone during the initial operation makes it much easier to perform a revision artificial knee replacement later in life. The knee is made up of 3 bones. The femur (thigh bone), the tibia (shin bone), and the patella or knee cap. 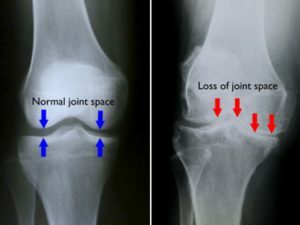 The joint acts as a hinge with some rotation. The bones are coated in articular cartilage. The function of articular cartilage is to absorb shock and provide an extremely smooth surface to facilitate motion. We have articular cartilage essentially everywhere that two bony surfaces move against one another, or articulate. Arthritis is a general term covering numerous conditions where the joint surface (articular cartilage) wears out. When this occurs, the bone ends rub together and this is painful. There are numerous conditions that cause arthritis and often the exact cause is unknown..In general it affects people as they get older (Osteoarthritis-wear and tear arthritis). However the exact cause is often unknown and may be secondary to trauma, infection, inflammation or increased stress (overuse, overweight). Unicompartmental knee replacement is an appropriate surgical option in selected cases of arthritis affecting one side of the joint only. 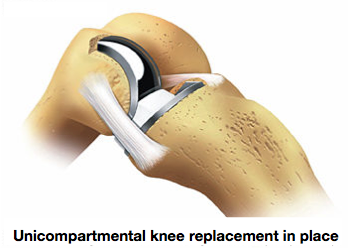 Each unicompartmental knee replacement is made of three parts. A plastic insert that sits between the femoral and tibial components and provides the slick surface. The tibial component (bottom portion) replaces one side of the top surface of the shin bone, the tibia. it is made of metal. Surgery is performed under sterile conditions in an operating theatre under spinal or general anaesthesia. An incision is made over the affected knee and the damaged portions of the femur (thigh bone) and tibia (shin bone) are then removed. The surfaces of the knee are then replaced with the implants. The knee is then carefully closed and bandaged. Please notify your surgeon if you are taking any anticoagulants (blood thinners) or arthritis tablets. You must contact your surgeon before you go into hospital if you have any evidence of broken skin, ulcers or pimples around the knee which is to be operated on or if you have a cold, cough or infection. Your surgery may have to be postponed until you have clearance that you are fit again to have the surgery. Admitted the day before or the morning of surgery. Most patients are able to go home after spending two to four days in the hospital. You can be discharged from hospital when you can demonstrate a safe ability to get in and out of bed, walk with your crutches or walker, go up and down stairs safely, and access the bathroom. All stitches are usually dissolvable therefore do not need removed. The decision to proceed to surgery is made when the advantages of surgery outweigh the potential disadvantages. Some complications require revision to another joint replacement. This occurs in 1 in 100 people and is a major complication and may require further surgery, and a prolonged stay in hospital. The clots cause leg swelling and may break off and travel to the lungs (Pulmonary embolism) in 1 in 100 people and can cause death in 1 in 200. The knee will be sore after the operation. Pain will improve with time. Rarely, pain will be a chronic problem and may be due to other complications listed below, or , for no obvious reason. Like your own knee the your new knee replacement can wear out or loosen. However 9 out of 10 knee replacements are still working after 15 years. Numbness at the side of the incision usually occurs. This may be temporary or permanent. This rare complication may require further surgery. Stiffening of the knee causing difficulty in walking and sitting and pain on movement. This occurs in 1 in 100 people and may require a period of immobilisation after the operation or possibly the need for further surgery. Osteoarthritis of the knee sometimes affects one side of the knee far more than the other. While either side can suffer greater damage, usually the inside half of the knee joint (the medial compartment) is more affected. When this uneven damage occurs to one side of the knee, the other side may still have good cartilage on the joint surfaces. In some cases, surgery to realign the angles in the lower leg can result in shifting pressure to the other, healthier side of the knee. 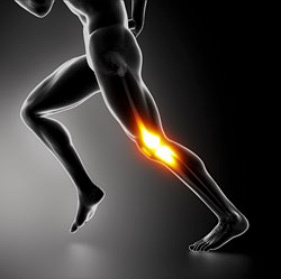 The goal is to reduce the pain and delay further degeneration in the weaker half of the knee. This procedure is most often used for younger, active patients and for those who have osteoarthritis in only one side of their knee joint. Its aim is to increase the life span of the joint and prolong the time before a knee replacement surgery becomes necessary. Surgery is performed under sterile conditions under spinal or general anaesthesia. An incision is made on the outside of the knee to allow the surgeon to see the upper end of the tibia. Care is taken to protect the nerves and blood vessels that travel across the knee joint. Once the tibia bone is exposed, two cuts are made through the upper tibia in the shape of a wedge. The surgeon uses X-rays to make sure the wedge is the right size and is placed correctly. The wedge of bone is removed, and the two sides of the tibia are brought closer together and held in position with a metal plate. This changes the angle of the tibia to offload the inside of the knee. Following surgery the leg is placed in a padded splint or cast to protect the knee joint and allow the bone to heal. Patients should cease smoking two weeks prior to surgery as this increases the risk of life threatening blood clots. Admitted the night before or morning of surgery. Most patients are able to go home after spending one to two days in the hospital. 9-12 weeks aerobic exercises such as swimming, static cycling and walking are begun. 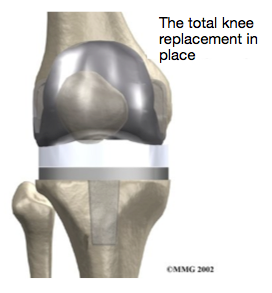 Each total knee replacement is made of two parts. The tibial component (bottom portion) replaces the top surface of the shin bone, the tibia. it is made of two parts: a metal tray that is attached directly to the bone, and a plastic spacer that provides the slick surface. Just a short note of many thanks for the great work from yourself and your team. I have both my knees back to where my life is so much better - able to walk & sleep without pain. It [Bilateral Knee replacements] is a wonderful operation and gives people their lives back!! Well what can I say but thanks to you and your team for giving me a new lease of life with my knee replacement. I will think of your skills, encouragement when I am enjoying life to the full with my family due to you all. I am very grateful for the wonderful gift you have given me. Many thanks for your care and expertise. I would like to take this opportunity to thank you for seeing me so expediently, and for everything that you have done following my scan. Your astute judgement and endeavours in the operating theatre have made this experience painless and have encouraged much optimism and positivity in the rehabilitation period, which is progressing smoothly. Very many thanks for your wonderful care and attention given to me in my recent operation. It was really helpful to be kept informed of what was happening, and overall I found the experience an enjoyable one. Thanks and Best wishes. Thank you so much for bringing me through this operation. Your care, kindness and professionalism shone through. You're so positive and confident that it helps us so much. Long may you continue to serve the people in this way. Thank you for all the kind and expert care you gave me while I was in hospital. For all your concern, kindness and skills which have enabled me to recover and a chance to enjoy life to the full once again.